Although Arts and Crafts homes were built in each city, the most remarkable examples arose in the countryside far beyond the reach of urban uniformity. Here vernacular tradition and skills had often survived and a union of art with landscape was possible. At this time architects were thoroughly schooled in history, particularly at Edinburgh's national School of Applied Art (from 1892) under architect Robert Rowand Anderson. The National Art Survey, a reference collection of measured drawings of buildings and their furnishings, was the work of School bursars. Such drawings encouraged respect for tradition and promoted twin skills of observation and craftsmanship. Home designs and furnishings brought together a sense of tradition with modern comfort on a modest scale. Colour and craftsmanship combined with an application of texture - furniture was often applied with handmade metalwork decoration or marquetry panels. Appliqu� work in textiles also provided a rich layering of materials and ideas. Perhaps more than any other craft, window glass had the magic power to transform an interior space. Around 1900 the garden was also seen as part of the home, carrying the romance of a house design into the landscape. The crafts made for the garden included wrought ironwork, ceramic wares and wooden furniture. This section includes short films specially commissioned to illustrate three private houses: Earlshall, Fife (designed by Robert Lorimer, 1891-94), The Longcroft, Helensburgh (A. N. Paterson, 1900-2), and Skirling House, near Biggar (Ramsay Traquair, 1906-8). The National Art Survey was set up by the architect Robert Rowand Anderson in 1895, three years after the opening of the School of Applied Art under his direction. The School was for the professional training of architects and those involved ‘in the constructive trades’, and, although it was located in Edinburgh, its remit was officially nationwide. Apart from architecture and the crafts of the built environment, classes were also offered in bookbinding and lithography, typography and silver and goldsmithing. The National Art Survey required the School’s best architectural students to record a building and its furnishing in considerable detail. They developed both skills and knowledge while also building a national reference collection. Ramsay Traquair, son of the artist Phoebe Anna Traquair, was one of the first bursars appointed to work on the Survey. One of the first buildings to be surveyed was the Palace of Holyrood House which occupied successive students for some five years. Drawings included the rooms, panelling, furniture, ironwork and plasterwork. Tapestry was also recorded, as seen here. Rutherford moved to London in 1899 where he worked in quick succession in the offices of John Belcher, Leonard Stokes and W D Car�e. He settled in York in 1901 first as assistant, and later partner, to Walter Brierly. James Gillespie had a keen eye for the detail of Scottish architecture. Gillespie would join the office of Sydney Mitchell & Wilson in 1901, leaving after two years for that of Rowand Anderson & Paul. In 1903 he won the Banister Fletcher Bursary awarded by the London Architectural Association which allowed him to travel in Scotland, France and England, studying ecclesiastical and secular buildings. He left the Anderson office in 1916 to take up an appointment with H M Office of Works. Gillespie taught at Edinburgh College of Art for some years, encouraging a traditionalist way of thinking based on sound knowledge of the past. The architect David MacGibbon had been elected president of the Edinburgh Architectural Association in 1880. He gave a series of lectures that year on early Scottish art and architecture, followed in 1883 and 1884 by Scottish castles and houses. These led directly to the five volumes published between 1887 and 1892 under the above title. Thomas Ross, partner in his practice who had also assisted with the lecture research, became MacGibbon’s co-author. They produced a companion series of book in 1896-97 under the title The Ecclesiastical Architecture of Scotland. Both sets of books soon became standard reference works to be found in the office of every Scottish architect, and are still used today. This was one of the few Scottish books to publish native new domestic design, and it gives an interesting snapshot of taste in the Edwardian age. Published by a newspaper, The Aberdeen Journal, its photographs and line drawings included houses built or proposed at that time. The range of home design was wide, from garden city cottage design by Ramsay Traquair to urban interiors by Aberdeen’s William Kelly. Nicoll, a Dundee architect who later emigrated to New Zealand, underlined the appropriateness of materials and local colour in architecture, supporting Robert Lorimer at the expense of C F A Voysey. The drawings made by National Art Survey bursars were published from 1921 and joined the books from MacGibbon and Ross as standard reference books. Earlshall, a long celebrated example of a restored home, was one of many buildings illustrated. Rowand Anderson encouraged James Gillespie, who had been a National Art Survey bursar and worked in his office, to work on this volume. Like the National Art Survey drawings, it would be finally published after the First World War. Rowand Anderson would not live to see it but it would be dedicated to him. Bruce Home, apprenticed to an Edinburgh lithographer, studied art at the Royal Scottish Academy schools. On his return in the 1890s from London he became part of the circle of Patrick Geddes. He was appointed first curator of the Outlook Tower, and, later, first curator of the capital’s municipal museum housed in the seventeenth-century Lady Stair‘s House in Wardrop’s Close, newly restored in an Arts and Crafts style by George Aitken. He made a special study of the buildings of the Old Town and its history, and was also a collector of ballads. The moulded cornice and complementary base were almost typically late Victorian. However, the linenfold panelled doors and side panels and initial carved sections are very much Lorimer’s personal re-evaluation of early seventeenth-century Scots design. The overall proportions of the piece and the design and placing of the metalwork door handles are attuned to 1890s British Arts and Crafts practice. Like the exterior of Dummy Daws - the earliest section of Earlshall to be worked - the press bears the initials of Robert Mackenzie (RWRM) and his wife (JRSM) and the date of the piece. This drawing by Begg was the choice of the architect Robert Lorimer to represent his own work in the Diploma Collection of the Royal Scottish Academy. John Begg had trained as an architect in Edinburgh and London and would work in India before heading the architecture section of Edinburgh College of Art from 1922 to his retirement in 1933. He was an editor of the published National Art Survey and much involved with the Royal Incorporation of Architects in Scotland. Lorimer had met Begg in London and they became firm friends. The drawing beautifully illustrates the recent restoration of the old seventeenth-century Earlshall house and formal garden. house for a Perth textile manufacturer Robert Mackenzie. Other furniture designed for Earlshall at the same time by Lorimer included a settle, a dresser and a coffer for linen or blankets, all with marquetry by Whytock, Reid & Co., a long table with companion benches, and the oak linen press displayed here. William Wheeler, born in Kinghorn, had worked in Glasgow, returning to Fife to settle in the village of Arncroach about 1877. He was a wheelwright, joiner and carpenter, and particularly favoured by Lorimer as a rural craftsman. He was the first of three generations of craft woodworkers in his family. This is one of several pieces of furniture designed by Mackintosh for Gladsmuir, Kilmacolm, the home of the Davidson family. The Davidsons’ son, William, a Glasgow provisions merchant, would commission the house Windyhill from Mackintosh in 1900. Mackintosh designed several pieces for Gladsmuir: a fitted cupboard for the drawingroom, a desk and two tables, of which this is one, with companion benches, for the schoolroom. The design is very much an artistic and Scottish version of the ‘Arts and Crafts’ table, with a concentration on plainness of material and surface and the construction emphasised through the detailing of the stretchers. A Scottish thistle motif, a detail perhaps suggested by the Davidsons, is pierced in the sides of the legs. This is one of a pair of benches designed to be used with the schoolroom tables for Gladsmuir. The same Arts and Crafts principles of honesty of materials and construction used for the tables were applied to the benches. The cabinet was designed for Mrs Pickering, Braxfield, Lanark. Mrs Pickering was possibly related to Robina (Ruby) Pickering, a graduate of Glasgow School of Art and co-secretary (with Fra Newbery) of the Glasgow-based Scottish Society of Art Workers in 1898. Ruby Pickering had found work, presumably as an art teacher, in Dumfries by 1902. The design has similarities to a cabinet Mackintosh designed for Alex Seggie of Edinburgh that year. A drawingroom piece, the cabinet is feminised through the addition of a leaded glass panel and a lower panel which is to be decorated (perhaps painted, stencilled or even embroidered) with a rose design. Westdel, a house at number 2 Queen's Place, Glasgow, was the principal home of the printer and publisher James Maclehose. Mackintosh designed an upper bedroom which, although small, is considered to have been his first artistic ‘white room’. In this elevation drawing of the proposed the west wall, the concept of the room as a total work of art is quite apparent. Furniture, wall panelling and stencilling, lighting and window panes all contribute to a balanced space. Hearts and stylised roses create a delicate and harmonious decoration. The room was realised virtually as shown here. This drawing shows the heart of a bedroom designed for publisher James Maclehose for his house in Queen's Place, Glasgow. The moveable furniture designed for the room included a bed, wardrobe and dressingtable, all working together as complementary elements. Mackintosh also designed bathroom fittings for this floor. This design shows the proposal for the south wall, with bed and settle cosily placed either side of the fireplace. The foot of the bed displays an early example of Mackintosh suggesting carved decoration in his furniture, while the side of the settle to the right is pierced by four small squares, a motif to be associated with both Mackintosh and his Viennese contemporaries. This geometricised form contrasts with the Art Nouveau linear curves and use of natural motifs of peacock on the fireplace hood and hearts and roses on the frieze and bed end. Photographs of the room as completed were published in the German magazine Dekorative Kunst in 1902. The design was commissioned by James Maclehose a decade after he had turned to Mackintosh to furnish bedroom accommodation at his Glasgow home, Westdel. The design, near Skirling, was not built, but was sufficiently developed on paper to be illustrated in Walter Shaw Sparrow's book, The Modern Home (1906). Ramsay Traquair, who had been articled to Lorimer, produced a new design out of existing cottages on Skirling Green for Sir Thomas and Lady Gibson Carmichael. A short film of the Carmichaels’ house is shown later in this section. This is an important piece of furniture from the late 1890s. It formed part of the suite designed for the first ‘white room’ created by Mackintosh, and of all has survived in the best condition. Two of his designs for the room are also shown. The painted wood is enlivened by the addition of plain metal hinges of swept form and handbeaten figurative panels (designed and possibly also made by Mackintosh). With its rhythmic elegance it complemented other furniture and especially the wall decoration of the room. Melsetter was designed as a summer retreat by the London Arts and Crafts architect, writer and educationalist W R Lethaby for a Birmingham businessman, Thomas Middlemore and his Highland-born wife Theodosia. The previous year Lethaby had worked on the restoration of a church on the neighbouring Orkney island of Eynhallow. Lethaby reworked and extended an existing eighteenth-century house, respecting the traditional style of the country and ways of working. He designed some furniture for the house, including a sideboard which is now in the Victoria and Albert Museum. Much of the furnishing would have been the choice of Theodosia Middlemore, a friend of May Morris. These included Morris company tapestries. Lethaby also designed the chapel of St Colm and St Margaret at Melsetter for the Middlemores. Both chapel and house use a symbolism of form and detail typical of the architect. This design by a Scot for the English landscape makes an interesting comparison with Melsetter, Lethaby’s house for Orkney. Both Morris and Lethaby worked closely with local masons to build their houses using stone found in the area. When he designed Hinton, Morris had recently returned to Ayr from London where his office been based between the mid-1880s and mid-1890s. He had mixed there with fellow members of the Art Workers’ Guild who included Lethaby. In 1931 this drawing was to be his chosen diploma work to be presented to the Royal Scottish Academy . Hinton was commissioned by Charles Cunningham Church. It has the tight but practical organisation of much of Morris’s work, but also shows a respect for English craft ideas, such as the Elizabethan mullioned windows and the extravagant strapped door hinges reminiscent of the work of A H Mackmurdo’s Century Guild in London a decade earlier. Windyhill in Kilmacolm was commissioned from William Davidson junior. Mackintosh supplied a certain amount of furniture for the house which, with fitted woodwork including fireplaces, ceiling beams and skirting boards, was made by Hutcheson and Grant who had also worked on designs by Herbert McNair. The simplicity of this chair, which with its companion, stood guard either side of the entrance hall fireplace, simplified its manufacture. The chairs also served as carvers when the hall was in use as a diningroom. The design, at once modern and traditional, is partly based on vernacular prototypes, including the Orkney chair. The form is both balanced and quite expressive, and the detailing, such as chamfering, very finely worked and typical also of the standard natural to Whytock & Reid. A number of chairs to this design were made, with both Kellie Castle and Earlshall in Fife supplied with at least one example. Walton’s company had been established in Glasgow in 1888 as ‘George Walton and Co., Ecclesiastical and House Decorators’. He first exhibited at the Arts and Crafts Exhibition Society in 1890, and moved to London in 1897 while keeping his company workshops in Glasgow. In the mid- to late-1890s he designed furniture, glass and wallpapers in an expressive Arts Crafts manner. His most famous chair was the ‘Abingwood’, sourced in the seventeenth-century caqueteuse form of widening arms and simple splat back punctured by a heart motif, forms which he exaggerated into a highly artistic design. This more elegant armchair has a simplicity of refined form and respect for the inherent qualities of the wood. It retains decorative features including a (now diminutive) heart motif towards the top of the central back slat. 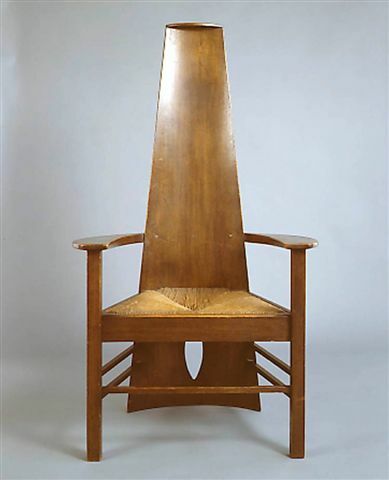 This is a very different, altogether more feminine, design to that of Mackintosh or Lorimer‘s contemporary chairs in oak. Like many designers associated with the Arts and Crafts movement, Townsend trained (and practised) as an architect. His best-known public buildings are the Whitechapel Art Gallery and the Horniman Museum in London. He often used plant motifs to decorate exteriors, and supported the use of mosaic as an alternative to stone or plasterwork. He employed other artists to work on this with him. Townsend also designed complete Arts and Crafts interiors, including church pews and stalls. Townsend is known to have already provided Morton & Co. with a textile design in 1892. ‘Omar’ is one of Charles Harrison Townsend’s few large-scale designs for textiles and was inspired by Turkish velvets of the sixteenth and seventeenth centuries. By recruiting Townsend, Voysey and others to design for Morton & Co. in the mid-1890s, James Morton was engaging with - and leading - modern fashion. Lorimer sketched his designs for furniture which were detailed and worked up by the independent craftsmen he used. However, he would have decided on the use of linen fold panelling and the figurative carving of the headposts both of which give this bed a medievalist identity and anticipate his work at the Thistle Chapel at the end of the 1900s. The figures may have been intended to ‘watch over’ the sleeper. Similar figures had been carved by the brothers William and Alexander Clow on cradles for Mary, the infant daughter of Sir William and Lady Burrell and for his own children. The Burrell cradle was made by James Joe, and this would probably also be made by him. This well-made chest of drawers retains the quality associated with the makers so often used by Lorimer but bears more of the cabinetmakers’ ideas and identity than that of an architect. The natural plant and leaf decoration on the smoothed front corners was conceived by a craftsman used to working closely with his materials and developing detailing to suit the particular wood. This mirror and stand was designed in 1898 when it was sketched in a letter from Lorimer to his friend and fellow architect Robin Smith Dods who by now was working in Australia. A number of versions of this popular design were made in different woods by Whytock & Reid from that date until the 1920s. The embroidery was made for the dining room of the Longcroft, the home of Maggie Hamilton Paterson, Alexander N Paterson and their children, and was exhibited in Glasgow at both the 1911 Scottish National Exhibition of History and Industry and the 1916 exhibition of Ancient and Modern Embroidery and Needlecraft at the Glasgow School of Art. The subject of putti with grapes and flowers was well suited to a dining room, and the glazed wooden frame designed by A. N. Paterson in an appropriate classical style. A N Paterson and Maggie Hamilton married in 1897. This, their second home, was designed by Paterson himself, and was to be given the simple, romantic name of ‘the Croft’, soon to be adapted as the Long Croft, or Longcroft. Designed in 1900, it was completed in 1902. Paterson’s designs detail an artistic house of comfort and convenience. After travels in America in the mid-1890s he had produced ‘A Study of the domestic architecture in the United States of America in the year 1896, with special reference to questions of plans, construction, heating, drainage etc.’. His designs for the exterior, interior and plan also bear many thoughtful references to history, and Paterson would subscribe to most of the books published on Scottish building in the first quarter of the twentieth century. Mary Henderson was a typical ‘all-rounder’ as an artist and teacher. She trained at Glasgow School of Art in the early 1900s, and practised as an artist in oil and watercolour and as an etcher, illuminator, enameller, embroiderer, and not least a metalworker. ‘Polly’ Henderson taught embroidery at Motherwell Technical School, drawing and metalwork at Stirling, and became head teacher of art at Helensburgh. This mirror was made for fellow art teacher Mary Begg (see section C), a close friend and a descendant of Isabella Burns Begg, sister of Robert Burns. They had met at the Saturday classes at Glasgow School of Art. The motto of this finely worked mirror frame was personal to Mary Begg, the recipient. ‘Better a wee bush than nae bield’ was devised by Burns for his own coat of arms in May 1796. Scottish both in its Celtic pattern and motto, it emphasises nature and the home as shelter, or ‘bield’. Paterson was born in the Gorbals in Glasgow and worked in London, possibly with James Powell of Whitefriars where he became interested in the technology of glassmaking. He experimented with acid etching and the use of hydrofluoric acid, and, still in his 20s, lectured on this at Gresham College. He set up his own studio in Glasgow in 1886 and was later featured in The Studio magazine. His workshop made glass which was primarily domestic although he was contracted to provide glass for both the Pacific and Orient Shipping Company and the Cunard Line. Ships fitted with his glass included the ill-fated Lusitania. In the 1920s Paterson’s studio made a series of windows for St Magnus Cathedral, Orkney. Oscar Paterson’s relatively small windows to be fitted into door panels or served as windows often illustrated European street scenes with a ‘folk’ atmosphere. The panels were made for as bed hangings for Mrs Blackie’s bedroom at the Hill House, Helensburgh, the house designed in 1902-03 by Margaret’s husband, Charles Rennie Mackintosh, for Walter Blackie. The method of working is rich and varied, as with other textiles designed and made for the Hill House. In design terms the panels combine modern interpretations of eastern and western art. Mrs Walter Blackie (n�e Younger) was a sister of Jane Younger who had studied at Glasgow School of Art with Margaret Macdonald (both appear in the group photograph in section B of the exhibition). Both Younger and Macdonald had taken part in the 1902 Turin exhibition. Their friendship may not have had any bearing on the employment of Mackintosh to design the Hill House, but it probably did in the area of its textile furnishing. This remarkable creative, modern textile was one of several made for the drawingroom of the Hill House, Helensburgh. Margaret Macdonald Mackintosh also made the lampshades and the mosaic panel above the fireplace. Antimacassars were familiar pieces of household textiles in this period but nowhere more exotic than this particular example. The design has been used recently to create modern replicas to furnish the house today. The pair of original bed hangings for Mrs Blackie, designed and made by Margaret Macdonald Mackintosh, are also shown. Muriel Boyd made a number of embroidered hangings for the Bearsden home she shared with her husband Archibald Sandeman and their son and daughter. Now much faded - the rhododendron flowers were originally a rich red - the hanging furnished the dining room for many years. The motto ‘better a dinner of herbs where love is than a stalled ox and hatred therewith’ was taken from Proverbs 15. Today, Margaret Gilmour is one of the best-known of the ‘Glasgow Girls’ for her domestic items worked in repouss� brasswork but the field of decorative craftwork in which she worked was wide. One of eleven children of a muslin manufacturer, she attended the Glasgow School of Art in the late 1870s, and, with her sister Mary, started a studio in West George Street where they both taught metalwork, embroidery, leatherwork, ceramic decoration, woodcarving and staining, and painting. Margaret had her own stand at the 1901 Glasgow International Exhibition. The Macdonald sisters, who shared a Hope Street studio in Glasgow in the 1890s, worked in a variety of metals to produce candlesticks and sconces, mirror frames, metal bookcovers and decorative panels. Frances also designed jewellery. A sconce was used to reflect and amplify the light of a candle placed in its holder. They might be made of silver to maximise the light but Arts and Crafts workers often preferred more ordinary materials and used brass or, as in this case, copper. Like that of Margaret Gilmour’s mirror, the design is of a peacock, a popular one also to be adopted for a sconce (this time electrified) by the London enameller Alexander Fisher in 1900. The sconce was owned by the designer Talwin Morris. George Walton’s designs extended to metalwork. He designed cutlery for his main patron George Davison which was made by William Comyns and Sons Ltd. and also shown at the 1903 Arts and Crafts Exhibition Society. This candlestick, one of a pair, is a satisfyingly simple in its geometrised reduction of the candelabra form. It was also exhibited in 1903 with the Arts and Crafts in London. In 1904-05 Mackintosh designed new interiors for Hous’hill, in Nitshill Glasgow, a house rented by his patron Catherine Cranston and her husband Major Cochrane. Furniture, metalwork and textiles were supplied, together with designs for stencilled decoration. The style was more modest and quiet than at the Hill House so recently completed for the Blackies. This is one a pair of candlesticks made by Peter Wylie Davidson to Mackintosh’s design for Hous’hill. The keyhole surrounds were designed and made by Morris for his home at Dunglass Castle at Bowling, Dunbartonshire, which he had purchased on his appointment as art director for Blackies in 1893. It remained his home until 1899 when it was acquired by Charles Macdonald, brother of Margaret and Frances. He designed many door and other fittings for the house, including textiles, many of which have long since disappeared. A number were illustrated in The Studio in 1897. Morris worked in a number of metals, including lead, a preferred craft metal of Frances and Margaret Macdonald, in 1895-96. Like them, he used it for mirror and pictures frames. This shade, unusual in Strachan’s work, was probably made from spare studio glass for the Edinburgh music room of Mr Sym, a friend of the artist from whose family it passed to the present owner. The colours of pink, green and blue are typical of 1920s domestic furnishings. Strachan’s use of painted streakiness is particularly noted in the pink areas. Strachan mixes flowers and their leaves with heart motifs in his decorative design. Deuchars was a skilled figurative modeller and sculptor who had trained with Goscombe John and worked with Mary Seton Watts at Compton in the 1890s and Inverness-shire in the early 1900s. The design was commissioned by Sir Robert Lorimer for the central panel of the library mantlepiece at Rhu-na-Haven, Aboyne. The design, to be carved in Hoptonwood (Derbyshire) stone, possibly by the firm of Allan & Sons, was also used at Lorimer's Kinellan, Edinburgh. The maquette was exhibited at the Society of Scottish Artists in 1912, and was subsequently also carved for a mantelpiece at Kinellan, Murrayfield in Edinburgh. He also designed a plaque depicting dolphin and putti for the library at Rhu-na-Haven. The design was commissioned by Sir Robert Lorimer for the central panel of diningroom mantlepiece at Marchmont, Berwickshire. The mantlepiece was carved by Allan & Sons, possibly by John Marshall. This charming drawing is very much a young man’s dream of a country cottage, with its low, sheltering roof, rubble walls and white-painted woodwork and neat garden. It has the whimsy and imagination also to be found in Salmon’s buildings and furniture. James Salmon junior was the third generation architect, following his father William Forrest Salmon into the profession. He spent time in the Glasgow office of William Leiper, learning from him much about the artistic aspect of architectural design. He worked in the family firm, training part-time at Glasgow School of Art in the mid-1890s. The family house at Kilmacolm, Rowantreehill, completed in 1898, was largely his work, and fitted with carved wood and windows (often depicting salmon) which he devised. He designed furniture including this wardrobe, which in its form and detail has his idiosyncratic touch. This is one of the most celebrated surviving pieces of furniture designed by Herbert McNair. His work had a strong sense of Symbolist rhythm distinct from the designs of Mackintosh. His work is also as practical as it is artistic. Each drawer or pipe rack in this piece serves a purpose, while the flourish of dominant curves has something of the air and form of a stylish gentleman’s waistcoat. The cabinet was exhibited at the eighth Viennese Secessionist exhibition in 1900 and later belonged to a Glasgow builder, John Turnbull Knox. The stool is of the kind popularly used in the Lorimer office itself as well as in domestic settings. Similar stools were supplied for use in the Thistle Chapel. Formakin was the country house which its architect, Robert Lorimer, wished to be ‘the purest Scotch I’ve ever done’. Commissioned by a stockbroker and friend, John Holms, it has a relative restraint of form and a subtlety of materials, using warm sandstone and a slated stone roof. It was a beautiful essay in colouring and detailing, with crow-stepped gables and bell roofs adding historic, picturesque references to a modern house. Work started on site in about 1909 but the house was never completed. The section drawing indicates Lorimer’s internal use of modern crafts including wrought ironwork (by Thomas Hadden) and ceiling plasterwork (perhaps to be executed by Thomas Beattie or Sam Wilson). The natural world inspired many Arts and Crafts workers, and especially those engaged in textiles and metalwork. The rose motif, common in Glasgow work, is used for much of this piece which also features the dragonfly. In the years around 1900, the dragonfly, or demoiselle, was a popular motif in European applied art. 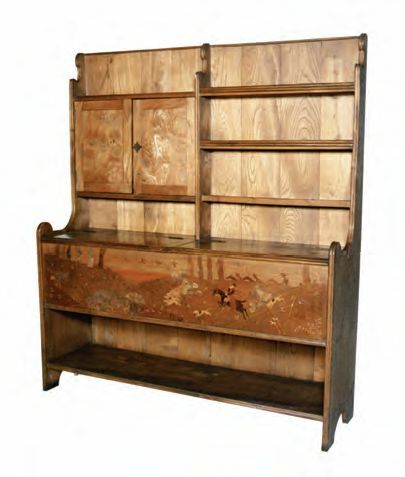 It was famously used by the furniture designer Louis Majorelle for his ‘demoiselle’ bed. Both roses and demoiselles were symbolic of women, or ‘Mesdemoiselles’. This wall sconce was thus particularly suited to drawingroom use. Marion Wilson was born in Glasgow, attending Glasgow School of Art over the years between 1884 and 1896. She was a prizewinner in several competitions. Like many women students at the School, she was encouraged to try her hand at a range of crafts, with metalworking becoming her favoured metier. Her art metalwork was carried out in brass, tin or, as here, in copper, all worked on a metal frame. She used cabbage roses, stylised hearts and Celtic motifs, often with elegant female figures. The table is of a popular circular type which worked well on different scales. A design for a larger dining table, but with straight crossed stretchers, is dated 1913. That one was produced on several occasions by Scott Morton, for Kellie, at Balmanno Castle in 1918 and for his friend James Morton (of Alexander Morton & Co.) at Craigiehall, north-west Edinburgh, in 1923. This smaller table was a popular Scott Morton piece and is of a particularly sturdy design. The legs are a typical trait found in Lorimer‘s office, with the slow-turned twist used regularly in his furniture and, in a much more delicate version, in the woodwork of the Thistle Chapel (1909-11). Similar legs and curved stretchers are found in Scott Morton’s major work including the underframe for the piano for Lympne Castle, Kent (1909-11, now Royal Museum, Edinburgh). Thomas Hadden, rightly celebrated as the most important Arts and Crafts ironsmith in Scotland, was born in Hamilton of a family with a tradition in forge working. He had established a business in Silvermills Lane, Edinburgh, by the early 1900s and had opened his Roseburn workshop by the 1920s. Hadden made some household items such as radiator screens, firedogs and fenders in ‘armour bright’ polished iron, reserving the more natural wrought iron for dirty or exterior work - for firebacks, bell pulls and foot scrapers. Lorimer used him regularly for all manner of ironwork, including railings and gates, and not least to make the Casket containing the Roll of Honour for the Shrine of the Scottish National War Memorial. This simple but practical hall curtain, probably for the entrance doorway of their Tayport home, was embroidered by Margaret Foggie. Margaret Jack had married her artist husband in 1902. From the time of their engagement she embroidered domestic items to his designs. In the 1900s the Dundee Graphic Arts Association exhibitions and those of its successor, the Dundee Art Society, showed their book covers, collars and cuffs, lace and other items. Bailey Scott Murphy (1876-1914) had trained at the School of Applied Art and for a short time in the office of John Kinross to whom this book was dedicated. He set up in practice with Kinross’s nephew as Bailey Murphy and Kinross. This volume was the result of travels by Scott Murphy in which he was accompanied by James Gillespie. The two architects shared a love of old work. The craftsman most deeply influenced by this publication was Thomas Hadden. He was a subscriber to the book with, among others, architects Robert Lorimer, A Hunter Crawford, Frank Deas, Ramsay Traquair, A N Paterson, and James Miller. The Scottish section of this once famous book illustrated in some measured detail the ironwork at Traquair, Donibristle House, Caroline Park and (formerly at) Gogar House. Scott Murphy commented that ‘compared with England, there is a great dearth of wrought ironwork in Scotland, and what does exits is somewhat rude compared with English work, but it has a character of its own’. This character was what Thomas Hadden tried to capture in his modern work. Following the death of Rowand Anderson in 1921, Ross and Lorimer took over the publication of the National Art Survey drawings which continued until 1932. 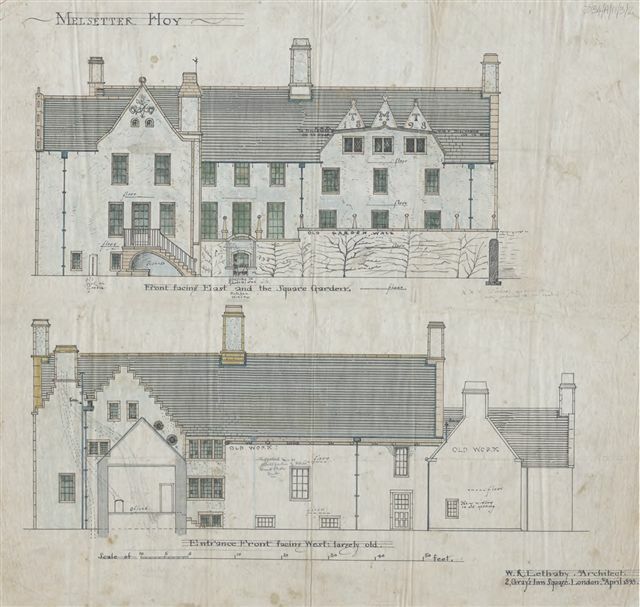 The plate of Pilrig House published measured drawings by Harold (Hal) Wright, one of the first bursars to work on the Survey. The ideal of a home in a rural setting survived well into the 1920s and 1930s, assisted by the expansion of suburbia across Britain. This publicity brochure for a leading furnishing company emphasised national pride in homemaking, and in Scotland where ‘a Scotsman’s home is his castle’. 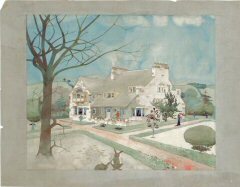 Typical of the time in its whimsical illustrations, the brochure underlined the Arts and Crafts idea of the homestead as shelter, set in a pleasant landscape. The home now combines the old ideal of whitewashed simplicity with modernity in the form of the steel window frame. Hadden’s work was imbued with tradition yet modern in its expression. An independent smith, his workshop was commissioned by a number of architects, particularly Lorimer, to supply a range of pieces for both interior and external house design. He occasionally exhibited his work with the Arts and Crafts Exhibition Society, and managed a substantial business which at one stage employed some thirty men to provide quality ironwork for the Scottish urban landscape and rural houses. Hadden is primarily remembered for his domestic work. Outdoor items included bell pulls, gates and railings, and garden ornaments, although he also had a substantial output of church work. These often had a practical use but some, as here, simply offered a poetic touch to the environment. For most architects in this period the garden was an extension of the house and to be carefully considered as an interior. Mackintosh was no exception. As he designed rose stencilling for the drawingroom of the Hill House, Helensburgh, so he also planned the garden. The bench was specially designed for the Hill House and was one of the last pieces to be contributed here by Mackintosh. A range of garden furniture and structures had been designed for William Davidson's house, Windyhill, when it was made by James Grant, but for the Hill House, Mackintosh turned to William Jack. Jack offered to make the bench fullsize in pine for �7.5s.0d., some two pounds cheaper than in teak. The dark stain successfully emphasises the seat’s rhythmic design. Mary Seton Watts (n�e Fraser-Tytler) was the second wife of the painter George Frederic Watts. She had been brought up on her family estate at Aldourie Castle, Inverness-shire, and studied art in Dresden and Rome before attending the South Kensington and Slade Schools. She married Watts in 1886. They shared a commitment to home arts work, and she is famed for her building of the memorial chapel in terracotta at Compton where they had their home. Mary Watts, who was also a painter and textile artist, started a pottery workshop at Compton in the 1890s. A second, although short-lived, pottery was developed on her family estate of Aldourie with clay specially imported. At both she employed Louis Deuchars. The Celtic designs of the potteries were close and sometimes identical, but in some Aldourie pieces, as here, the name of the pottery formed part of the pot design.